What were you doing before you started your course at Cranfield? I worked in the optical metrology industry for two to three years in Germany. Before that I studied physics and electrical engineering, also in Germany. My wife is Scottish but we lived in Germany, so we relocated here for this PhD. My wife was able to continue her work online from the UK. I now have a family here and am living in the village close to campus which means I can be very flexible. Could you explain what optical metrology is and what your research in Interferometric Signal Processing is? Basically its means measurement using optics, so laser-based measurement is quite a good way of describing it. You point a laser somewhere and you can measure changes in distance or changes in other properties. You can use it to measure technical items that require precision measurements, semi-conductor masks, or pistons’ shapes – things like that. You can also use it for looking at retina images; I was mainly looking at industrial applications, but there are also medical applications. In industry I was working on several things, more in the background doing the support mechanisms, a mixed bag of engineering jobs that were used for all these sorts of measurements. At Cranfield I initially looked at fluid measurements – measuring how fast wind moves. I’m a physicist and an electrical engineer by training so making measurements with light is quite a nice combination of the two subjects. I did some optics in my master’s and then I went on to work in the metrology industry. I came from there to continue studying and do a PhD in the optical metrology area, and basically interferometry is one of these types of measurement. Why did you choose to do this course at Cranfield? There are only three or four groups in the world where interesting work is going on in my specialist area and Cranfield is one of them. Cranfield has ten to twenty years of experience and this research group is respected in the field, which is important for publishing papers. Also Cranfield has a wind tunnel and although I didn’t end up using it, there was potential to! It’s an interesting research group, and there are only a few that specialise in that area. There was a scholarship and Professor Tatam allowed me to shape the subject. I sent an initial draft in and based on that work he was happy to allow me to do things in a way that I wanted. I had freedom to expand and in the end it evolved into something quite different. Has your research led to any particularly interesting activities? Well, towards the end of my PhD we got into industry applying some of it. Initially it was a blue sky research project which got more and more applied, and we then were able to start doing some commercial measurements with an industry partner, Oxford Instruments, who create scientific instruments. They were interested in vibration measurements. We measured vibrations on a new project line – a table-top cryostat – which provides a low temperature environment for physical experiments. This medal is in recognition of your thesis, drive and contributions to the university- can you tell me a little about your thesis? My thesis is actually on measurement within optical fibres – and this was the first application targeted within industry whilst I was doing my PhD. Are there any other ways you believe you or your research may have contributed to the University? It’s unusual to take an active role in bidding for a research grant during your PhD, so it was quite a lot of leeway that my two supervisors allowed me to take part in this project. My supervisors and I were successful in gaining an Engineering Physical Sciences Research Council (EPSRC) grant for £646,000 for three years. We want to make a device for robotic manufacturing. We’re combining my technique with one my supervisor works on to make a combined instrument to mount on a production robot that will give its three dimensional position relative to the work piece. You can also use it for laser based processing to focus control of a laser. A simple application of this would be to have a mobile robot that locks itself on to a conveyor belt in a production environment and it will keep parallel to that. It takes optical distance measurement, which measures distance along a laser beam, and an optical mouse-like technique which measures sideways movement. Together they allow you to measure in 3D. It also forms part of a second grant with Airbus Helicopters and others. We’re using fibres to look at changes of the shape of a helicopter while the blades are rotating, by measuring vibrations that can alter the aerodynamics of the helicopter blade. This is another project which also partially came out of my PhD research project. What does the King’s Norton Medal mean to you professionally? Well it will be good on my CV, but it’s also nice recognition that my PhD developed into a research grant, which has enabled me to be employed at the University. What are you doing now? What do you enjoy and find most challenging about your current role? I’m basically managing different research projects; we have two big ones that I’ve already mentioned and a few smaller. It’s very busy and challenging, you have to be adaptable and ready for a good opportunity to come along. This is one of the advantages of having well-connected people at Cranfield. I’m also trying to get student funding, and I have three MSc students who I’m supervising. But my main interest, probably 90% of my work, is research: what I enjoy is seeing my ideas grow and hopefully having an impact. Can you tell me a little about your long term goals, where do you see yourself in 5-10 years’ time? Currently things are going well and whilst I wouldn’t be scared of going back into industry, I’d prefer to stay in academia. The deadlines are longer and you can have more flexibility and space to develop new things, compared to industry where you are more likely to be fixing immediate problems. I see myself more as a researcher than a lecturer, but I would definitely like to try lecturing. How do you think Cranfield can help you with this? Well, you get interesting research projects, into good publications, and have students coming and working with you… generally having a good research environment. My group is particularly good – we meet for coffee regularly, we know what’s going on in each other’s areas, there’s opportunity for cross-fertilisation and there was the flexibility to take advantage of these opportunities while I was writing up my PhD. How did you fund your study at Cranfield and do you consider the experience and resultant qualification valuable? My PhD was supported by department funds, so it covered my tuition fees and included a maintenance grant. I wouldn’t have been able to take on a PhD without this situation. Do you have any advice for students considering postgraduate study? It does not hurt to have worked beforehand; you should not be scared to come back in to academia. It was actually an advantage -the technical skills I learned in two years working on the job were really compressed and were very helpful for my PhD. It’s more important to look for a subject which you are interested in not just any old PhD. Your PhD subject could determine the rest of your career, so you want to be sure it’s interesting. 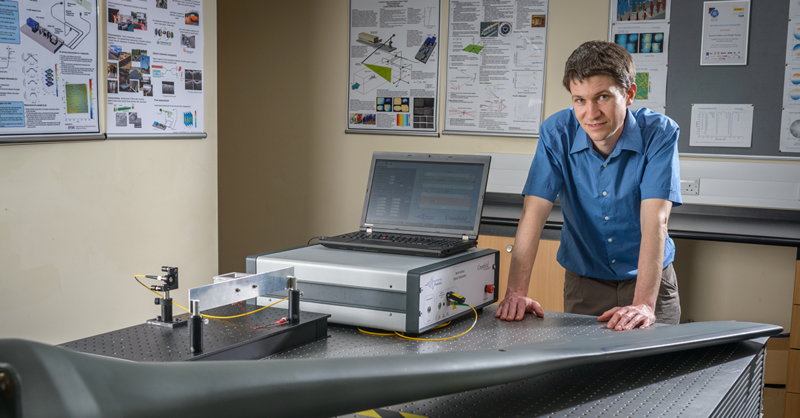 Thomas is a Postdoctoral Research Fellow here at Cranfield, studying Interferometric Signal Processing, which in his own words is essentially 'measurement using optics'. Thomas won the King’s Norton Medal for his exceptional thesis, drive and contributions to the university.